So let’s look back in time. When WCMS started in the late 90s, all the systems were clearly in the CMS camp. Over time, new ways of solving the website management issue came about. After all, not everyone needs full-blown WCMS when a simpler blogging tool would suffice. So when people started using these more streamlined tools to stand-up websites, the tools were quickly tagged with the CMS label. This was hasty and incorrect, but it was understandable. For many, the sole purpose of a CMS was to publish information to the web. This is incorrect, but we in the ECM side of the house ignored the situation, so it happened. The fact is that managing a website and publishing content and data to said website is different than managing content. In many ways it can be more complex. The two tasks aren’t mutually exclusive, but you can easily do one without being able to do the other. I wouldn’t use OnBase to manage my website just like I wouldn’t use WordPress to manage my Correspondence or any records. Some WMS solutions ALSO manage content well. 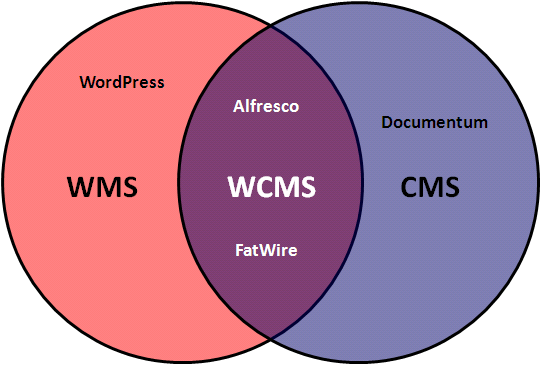 This intersection of a CMS and WMS is the more traditional WCMS category. Remember, there are good and bad tools in all three spaces. Not looking to categorize the world here, just illustrate. The size of the circles and amount of overlap are not indicative of anything. I also want to state that I wasn’t placing names in such a manner that the position within any circle matters. A system may be in one area by definition, but it doesn’t mean that there are not areas of gray. In reality, systems are going to be along a spectrum based upon how well they support WMS and CMS requirements. Let’s face it, it is a very gray/fuzzy world out there. WordPress is, in my opinion, a WMS, but one that is rapidly moving towards gaining WCMS status. The goal here is to help us to better understand what the capabilities of each system and what problems they are best at solving. It isn’t to say that that any system stinks (at least not today). Look at it from this perspective. I would not use Documentum to manage a website. Conversely, I would not use WordPress to manage my company’s documents. Systems in the middle, I could use for both, though that is a far cry from saying that it would be a smart thing. Remember, just because you can do something, doesn’t mean that you should do something. As we try and define what it means to be a Content Management professional, being able to categorize and define the tools and problems we work with is critical. The line is thin between WMS and WCMS. ¿What are the criteria used to differentitate between them? This criteria is key to know how to classify it. Actually, I discussed what makes a CMS a CMS last month. I meant to link to it in the post. Interesting post, good points. But where would you place CM frameworks like Drupal and Joomla? Drupal talks about the difference between specific and abstract tools. WordPress, MediaWiki etc are very specific fixed instances of CMS – they do one thing well and that makes them easier to administer, but less flexible to adapt. But on another dimension Joomla or Drupal are content-agnostic. You can build a workflow framework but there isn’t much domain knowledge about what rules might apply e.g. to a legal contract or ad artwork. Some say that we need to reclaim the DMS (document management system) label for products that do have strong rules. I say “reclaim” because it would have less to do with scanning/OCR and more to do with semantic web, etc. I wouldn’t know where to place them as I don’t know the products well enough. I have suspicions, but without enough facts, I couldn’t accurately place them. They are definitely WMS tools, I’m not sure if they have enough CMs to be WCMS. As I said in another reply, I defined what makes a CMS a CMS a month ago. That makes a good starting place for the discussion. Documentum is not a CMS. Alfresco ist not a WCMS. The question is. What kind of system do you need to do Content Management? Is it a CMS, ECMS, WCMS or a DMS? DMS is a subset of CMS. Documents are a type of content. Documentum, and similar systems, do more than documents. They have a WCMS solution, but only in definition (they correctly gave up and have partnered with FatWire). A Content Management system does not have to handle all types of content well. It has to manage content. Alfresco lets you manage a website. WCM is a strategy. If a tool allows you to implement a WCM strategy, then it is a WCMS. Alfresco is one, though not a simple one and it doesn’t manage your presentation. It is more platform than tool. Is it solely a WCMS? No. But it can readily be used as one. Something doesn’t have to have dedicated functionality to be something, though it makes it easier to engineer and deploy. People need to look beyond their own world of content. I’m far from an expert in Website Management. I do know Content Management, though I am not an expert it all types. Mobile content (things like ringtones, not just a streamlined UI) is an area that I know very little about. I do know that it is still content and that applications that can manage that content are likely to be classified as a CMS. Content Management pre-dates the web. As such, the ability to handle web content cannot be used to define a CMS. Also surprised to have see you “marginalize” Alfresco. The sophistry of categorization is always fraught with bias and emotion, I remember the “horror” when I explained I was in “content management” and their eyes lit up as they understood that I worked in WordPress etc etc. Don’t think I marginalized Alfresco. I did place it in the nice spot on the Venn diagram as both a WMS and a CMS. So, my problem with the new definition is that, for example, I am not just pumping my content items into WordPress, for WordPress to manage the sites that publish said content to the web. I am creating and yes ‘managing’ the content within WordPress. In your example, if you had an ECM ‘strategy’ that included creating content in Word, collaborating on it via eRoom and storing and managing the final version in Documentum, and then piping a copy of it down the new connector to FatWire, with FatWire managing the publishing to the web, then FatWire is the WMS (just as the old Documentum Web Publisher was – now ‘Web Publisher’ seems like a very apt name). I think Jed can always come up with exceptions to the rule, but the distinction you’re making is right. It’s not really a matter of pigeon-holing software functionality. It’s more about the strategy for handling content. If you take the scenario that content is being created in lots of places, not specifically for storage or publication, but to satisfy other business processes, and that content needs to be controlled, you’re looking at a CMS. If instead you’re trying to create content that will engage with your online audience and get them to fulfil key tasks on your website, you need a WMS. It’s generally easier to achieve the second use case with CMS than it is to achieve the first use case with WCM. As you point out, that’s largely to do with the history of these products. I’m not sure how that affects your Venn diagram though. The other point to remember is that where you have WCMS supposedly straddling both CMS and WMS functionality, it’s actually pretty rare in my experience that these really need to be truly joined up. How often do you need to collate lots of content from different sources to create an engaging and purposeful website? I think the middle ground is increasingly going to find itself squeezed. What’s going to be important for WMS is the ability to interact robustly with other website applications (social, CRM, eCommerce, DAM, analytics, etc.) and it’s the tools that achieve this that we’ll recognise as WCMS, leaving the pure web publishing tools behind. The straddling is more to do with the traditional WCM solutions, adding Web to the term CMS. Not creating anything new, just adding a qualifier. This goes back to the fact that CMS is more than just web content. I think pure web publishing tools will be around for a while. The smaller and mid-sized organizations that drove the adoption of the current wave of WMS solutions is still going to have a need. Proops, like you said, you can always rely on me to come up with an exception to the rule……..
Welllll……. My old UK employer, the Open University, has a highly complex main website, where potential students can surf all the available courses and sign up for them, and pay for them online. So this is definately e-commerce. It used to be a custom DLL on IIS pulling in stuff from an absolute quagmire of databases. It was replaced with a new system that uses the Documentum ECMS to manage the majority of the text and other assets that are assembled into pages. However DTCM Web Publisher was found lacking, so they are using Drupal to assemble and serve the pages. So Drupal (WCMS) with integrations to multiple MS SQL Server databases, Siebel CRM (I think) and Documentum CMS, plus others I am sure. This is why I think CMIS is so important, it will make such business led integrations easier, and thus make these product class definitions even murkier ! In retrospect, I think that as WMS installs, the number of applications that can serve as an ECM platform and provide a WCMS is going to shrink. The Content Management is not going to go away, but the number of other things is going to increase. It is very likely that while WCMS may be a subset of CMS, it may become so specialized that you won’t see products playing in WCMS and other locations.